What to do when permanent teeth erupt behind baby teeth? Parents often contact our office after noticing an adult tooth growing behind a baby tooth in their child’s mouth. This is a common inquiry we hear from parents and guardians of children aged five through seven. Could this presentation have a long-term impact on their child’s smile? In normal tooth development, permanent teeth start to grow underneath the baby teeth after birth. As permanent tooth comes in and up behind the baby tooth, it slowly resorbs the baby tooth’s root, leaving the baby tooth with no support. The baby tooth becomes loose eventually falls out so the permanent tooth can take its place. However, sometimes it doesn’t always happen for permanent lower incisors. Besides dental trauma, the most common “emergency” calls we receive are when parents notice two rows of lower front teeth. This appearance is often called “shark teeth”. Fortunately, it’s not a real emergency that requires immediate attention. 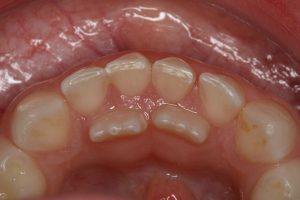 It is normal for the lower permanent incisors to erupt behind the baby teeth. We advise you to check how loose the baby tooth is. If it’s very loose, we encourage your child to work on wiggling it out. Once the baby tooth is out, the permanent tooth will be pushed out by your child’s tongue gradually. If the baby tooth is still firm, we ask you to take a photo of your child’s tooth and email it to us at northseattledds@gmail.com. Dr. Lin will assess if your child should come in for further evaluation. A radiograph (X-ray film) sometimes may be indicated to assess if the root of primary tooth has been properly resorbed as the permanent tooth comes in. If the root of a baby tooth is not resorbed as it should be, it may need to be removed. If you have further questions, give our office a call at 206-915-5090.